What's SwickDeck: SwickDeck is a userstyle for TweetDeck that implements a number of small improvements and allows for a bit of customization. 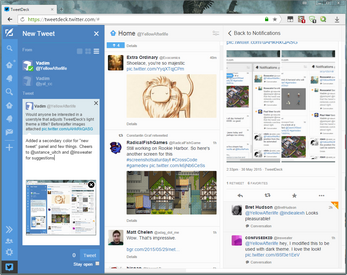 What's TweetDeck: TweetDeck is an official Twitter client/app that is rather convenient and feature-rich. If you haven't heard of it before, you should probably take a look. What's a userstyle: Userstyles are user-defined stylesheets (CSS) that allow to change how the websites look to you locally. Firefox and Chromium-based browsers can support these via an extension called Stylish. Adjust the options until desirable looks are achieved (a rough preview is shown underneath). Click "Generate CSS" to [re-]generate CSS code in accordance with chosen options. Copy it. Create (or open an existing one) a new userstyle in the aforementioned Stylish (or an equivalent extension). Paste the copied CSS code into the userstyle. If you are using a version of Stylish for Chrome, don't forget to fill out the domain for the stylesheet to apply to via the field under the CSS editor. Click "Save" to apply changes. If everything was done correctly, they should be reflected on the TweetDeck tab within seconds. can this work on latest tweet deck ? As far as I can tell, it works fine, save for that recent thing where the Tweet button is vibrant blue and expands to join the popout area. ah, i can't seem to get the dark version to work.